I am beginning to think that I buy bananas just to let them turn brown so I can make something with them. At least that is what it seems like lately. In less than a month I have made banana bread with vanilla brown butter glaze, banana Nutella bread, and now I made banana Nutella cookies. 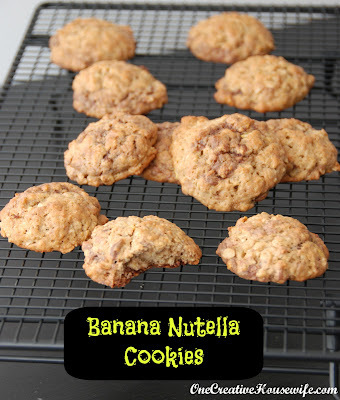 In my opinion these cookies needed more Nutella, but they were delicious banana cookies even without increasing the Nutella. Next time I make these I will be doubling the Nutella, or making a Nutella icing for on top. 2. In a large bowl mix flour, sugar, baking soda, and salt together. 3. Cut in the shortening. 4. Beat in bananas and egg. 5. Mix in the oats. 6. Drop the Nutella on top of the batter by spoonful. 7. Slice the Nutella into the batter, so it looks swirly. 8. Drop by spoonful onto a greased baking sheet. 9. Bake for about 8-10 minutes. we've recently discovered nutella at our house and my kids are addicted...we've got to try these delicious looking cookies! I have had a Nutella addiction since high school. My poor children are starting young...LOL Thanks for stopping by!